Heart Healthy Lenoir teaches Lenoir County residents that paying attention to fat and carbohydrate quality can substantially reduce the risk of heart attack and stroke. 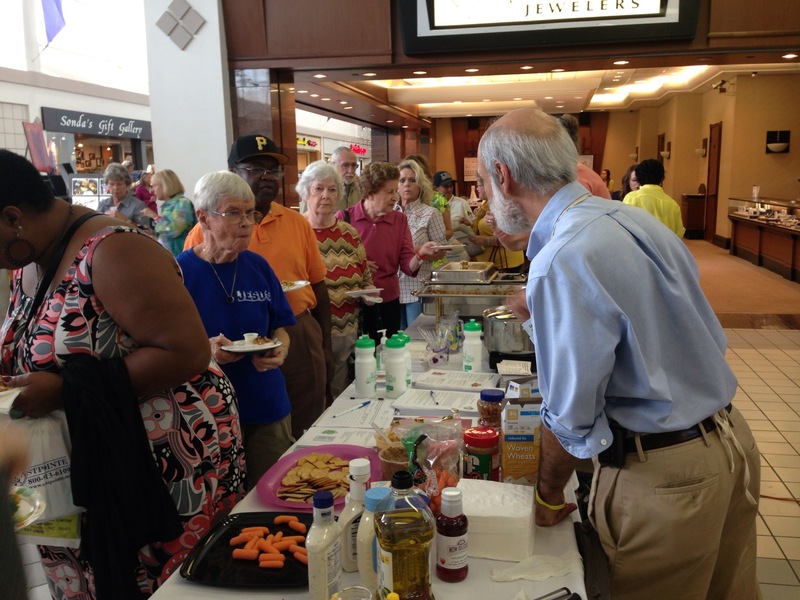 Tom Keyserling (right), the principal investigator for the lifestyle study within the Heart Healthy Lenoir project, serves up heart-healthy fare at the “Living the Good Life Expo” in Vernon Park Mall in Kinston, North Carolina. Heart-healthy hushpuppies — three words rarely, if ever, used in the same sentence. The secret? Using familiar and available ingredients (chopped sweet potatoes, okra, cabbage, beets, and nuts) and frying in healthful vegetable oil (peanut, soy, corn, or olive oil). The result: hushpuppies that look similar to standard fare, yet, taste great and are heart-healthy. In fact, for heart health, fat quality trumps quantity, Tom Keyserling says. As part of the UNC Center for Health Promotion and Disease Prevention’s Heart Healthy Lenoir project, Keyserling led a lifestyle study to improve diet quality in Lenoir County — the buckle of North Carolina’s “stroke belt,” a region along the Southeastern United States on the Coastal Plain that has a higher incidence of heart disease and stroke. “The rate of stroke and heart disease in eastern North Carolina is one-fourth to one-third higher than in the western part of the state,” he says. The lifestyle intervention was given during four monthly sessions, each focusing on different food groups. Not surprisingly, the session on fat quality versus quantity was deemed most helpful by participants. In the years before the study’s official start in 2011, the literature on low-fat foods underwent a drastic change. “Do you remember the old food pyramid with noodles and bread on the bottom and fat on top? Though well meaning, that pyramid was based on limited scientific evidence. Thanks to many large studies conducted in both Europe and the United States, we now know, in retrospect, that the old pyramid should be turned upside down,” Keyserling explains. In other words, daily consumption of high-quality fats — typically found in vegetable oils, nuts, and fatty fish like salmon — are critical elements of a heart-healthy diet. When high fat quality is combined with high carbohydrate quality (wholes grains, beans, and fruits and vegetables with minimal refined sugars and starches), similar to a Mediterranean diet, the risk of heart attack and stroke can be reduced by 30 percent. For the study, Keyserling and collaborators implemented a dietary intervention they have been refining over the last 15 years based on the most up-to-date scientific evidence. The emphasis on high-quality dietary fats allowed participants to consume traditional Southern foods like fried chicken and fish (when fried in non-trans fat vegetable oil), heart-healthy hushpuppies (as above), and full-fat dressing and spreads including regular salad dressing, mayonnaise, and tartar sauce (all of which are typically made with soybean or canola oil). “Some participants couldn’t believe that fried chicken, in appropriate oils, was acceptable as part of a heart-healthy diet,” Keyserling says. “‘That’s been on the bad list forever,’ they said.” Alice Ammerman, the principal investigator for the overall Heart Healthy Lenoir project, even developed a healthier barbecue featuring traditional Southern vegetables, small portions of meat, and a classic eastern North Carolina vinegar-based sauce, which reduces the need to season with salt. Trans fat is the worst kind of fat and a byproduct of hydrogenation — a process that turns healthy oils into solids (i.e. a stick of margarine) and prevents them from becoming rancid. This type of fat is linked to heart disease, stroke, diabetes, and other chronic conditions. Healthy fats found in vegetables, nuts, seeds, and fish are liquid at room temperature. At the one-year follow-up, participants reported improved dietary intake; blood pressure levels among those studied decreased substantially; and blood carotenoids — biological markers for fruits and vegetables — also improved. As part of an effort to reach out to the larger community, Keyserling, Ammerman, graduate student Linden Thayer, and colleagues also organized a restaurant project to help customers at both chain and independently owned establishments make heart-healthy food choices. The 10 participating restaurants displayed the project poster, used table tents with information on healthy eating, and distributed brochures with 10 tips for a healthful diet. They also distributed more than 4,000 coupons offering discounts to patrons for making healthier choices like choosing a wheat bun over white or a drink low in sugar. Overall, the lifestyle program demonstrated that a diet promoting high-quality fats and carbohydrates was well received by study participants. In following close to 350 participants over 24 months, Keyserling and his team observed that most were able to maintain their dietary changes and experienced a meaningful reduction in blood pressure. In the future, he and Ammerman hope to create a web-based program easily given by health counselors at primary care clinics and health departments to help people improve their diet. Tom Keyserling is a professor of medicine in the Division of General Medicine and Clinical Epidemiology within the UNC School of Medicine. Alice Ammerman is a professor of nutrition in the Gilling School of Global Public Health and the director of the UNC Center for Health Promotion and Disease Prevention. She is also co-chair for UNC’s “Food for All” theme. This research was supported by a National Institutes of Health (NIH) grant as part of a collaboration with the Brody School of Medicine at East Carolina University and a Lenoir County Community Advisory Council representing many local agencies (health department, hospital, agricultural extension agency, public schools, community college, faith-based organizations) and interested citizens.